Bathroom Takeaway - Towel rails and Radiators. Up to 10 Year "Fit and Forget" Guarantee. 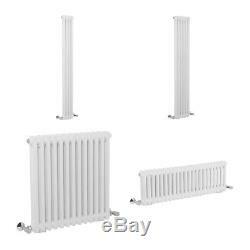 Traditional White Horizontal & Vertical Radiator Cast Iron Central Heating Rad. Straight vertical & Horizontal bars. Double & Triple bar model. Durable high quality white finish. Suitable for use on a central heating system. The Berns Range of white vertical & Horizontal column radiator. The Berns Range of white vertical & Horizontal column radiator adds a stunning period style to your suite, whilst combining the classic Victorian style with high heat output. Being manufactured from high quality steel and finished with a white gloss, this radiator maintains modern day expectations whilst retaining its traditional roots. Complete with fittings, plugs and vents for a simple installation and peace of mind with our 10 year'Fit and Forget' guarantee. Fixing pack included complete with plugs and vents. Pressure tested to 10 bar, maximum working pressure 7 bar. Manufactured in accordance to BS EN 442. We suggest you ask a qualified plumber to install this item. This range is often quite heavy and may require more than one person to handle it. 10 year "Fit and Forget" guarantee Included. 1800 x 200 mm Double Vertical. 600 x 605 mm Double Horizontal. 300 x 1010 mm Double Horizontal. 1500 x 380 mm Triple Vertical. 1500 x 200 mm Triple Vertical. 1800 x 290 mm Double Vertical. 300 x 1010 mm Triple Horizontal. 300 x 1190 mm Double Horizontal. 300 x 1190 mm Triple Horizontal. 300 x 1460 mm Double Horizontal. 300 x 1460 mm Triple horizontal. 600 x 605 mm triple Horizontal. 600 x 830 mm triple horizontal. 600 x 830 mm double Horizontal. 600 x 1010 mm triple horizontal. 600 x 1010 mm Double horizontal. 600 x 1190 mm double horizontal. 600 x 1460 mm double horizontal. 1500 x 200 mm double vertical. 1500 x 290 mm triple vertical. 1500 x 380 mm Double vertical. 1500 x 290 mm double vertical. 600 x 1460 mm triple horizontal. 1800 x 290 mm triple vertical. 1800 x 380 mm triple vertical. 600 x 1190 mm triple horizontal. 1800 x 380 mm double vertical. 1800 x 200 mm triple vertical. Towel Rail & Radiator FAQ. Can your heated towel rails be used on a standard central heating system? Yes our heated towel rails can be connected up like a normal radiator and all have high heat outputs - meaning they not only warm your towels, but your whole bathroom too. BTU stands for'British Thermal Unit' which is the measurement of the amount of energy needed to cool or heat one pound of water by one degree. One BTU is equivalent to about 0.3 Watts. How are your heat outputs calculated? Our heat outputs are all independently tested using EN442 regulations. Unlike other retailers we give the true heat output rather than a fictitious figure. We recommend asking any retailer for the heat output certificate for a particular product. Can this towel rail be converted to dual fuel? Yes our heated towel rails can be run on two energy sources, meaning that you can have run the towel rail from your central heating in the winter and your electricity supply in the summer. Warm towels all year round. (You can not convert Traditional/Victorian towel rails to dual fuel). What do I need to make my towel rail dual fuel? All you need is one of our dual fuel kits and you're ready to go, take a look at our range by clicking here. Can the Heated Towel Rail be used as electric only? Heated towel rails can be used as electric only. The element is to be fitted, and then the towel rail filled with 95% water and 5% inhibitor, leaving a 25ml gap at the top. If using as electric only (completely isolated), as long as the 25ml gap is left at the top there is no reason for it to overflow. The expansion and contracting is all done inside the radiator and can do so freely as long as there is a sufficient gap at the top of the towel rail. We do recommend that a qualified installer carries out the installation of your Electric Towel Rail. What are the Electric Towel Rails filled with? They are filled with a water Glycol solution which is an anti-corrosive liquid. Do I need straight or angled valves for my towel rail? The type of valve you will require depends on the installation of your towel rail. If your pipework is coming up from the ground, then generally straight radiator valves are used. Whereas if your pipework is coming from the wall at an angle, angled valves would be used. You can find our full range of valves available here. Do your towel rails come with a guarantee? All of our towel rails come with a standard 10 Year'Fit and Forget' Guarantee giving you the ultimate peace of mind. Who should install the towel rail or radiator? We recommend that any central heating towel rail or radiator is fitted by a qualified plumber/heating engineer, and any electrical items are installed by a qualified electrcian. We aim to make the purchasing process as easy as 1-2-3 without compromising quality or service. Based in Trafford Park, Manchester we have a massive 10,500 pallet warehouse with state of the art electronic order and picking systems to ensure that you receive your order in full - and on time. The item "Traditional White Horizontal & Vertical Radiator Cast Iron Central Heating Rad" is in sale since Friday, June 15, 2018. This item is in the category "Home, Furniture & DIY\Heating, Cooling & Air\Air Conditioners & Heaters\Radiators". The seller is "bathroom-takeaway" and is located in Trafford Park. This item can be shipped to United Kingdom.